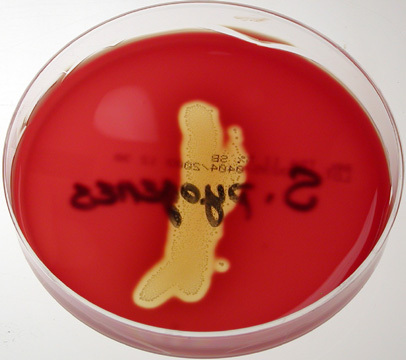 Blood agar contains general nutrients and 5% sheep blood. It is useful for cultivating fastidious organisms and for determining the hemolytic capabilities of an organism. Some bacteria produce exoenzymes that lyse red blood cells and degrade hemoglobin; these are called hemolysins. Bacteria can produce different types of hemolysins. Beta-hemolysin breaks down the red blood cells and hemoglobin completely. This leaves a clear zone around the bacterial growth. Such results are referred to as β-hemolysis (beta hemolysis). Alpha-hemolysin partially breaks down the red blood cells and leaves a greenish color behind. This is referred to as α-hemolysis (alpha hemolysis). The greenish color is caused by the presence of biliverdin, which is a by-product of the breakdown of hemoglobin. If the organism does not produce hemolysins and does not break down the blood cells, no clearing will occur. This is called γ-hemolysis (gamma hemolysis). The hemolysins produced by streptococci perform better in an anaerobic environment. Because of this, it is standard procedure to streak a blood plate and then stab the loop into the agar to provide an area of lower oxygen concentration where the streptolysins can more effectively break down the blood cells. This streptococcus pyogenes exhibits β-hemolysis.